Telpro Sawtooth Ribbon Anodes are a new product development for Telpro. We corrugate a flat ribbon to increase its overall surface area to obtain a higher current output. Telpro Sawtooth Ribbon Anode is manufactured using titanium which meets ASTM B265 Grade 1 which has been coated with Telpro Mixed Metal Oxide Coating. Telpro MMO coating consists of IrO﻿2﻿/Ta2O5 and is suitable for use in all cathodic protection applications. Because mixed metal oxide anodes have a very low consumption rate the titanium substrate remains constant throughout the design life of the anode. 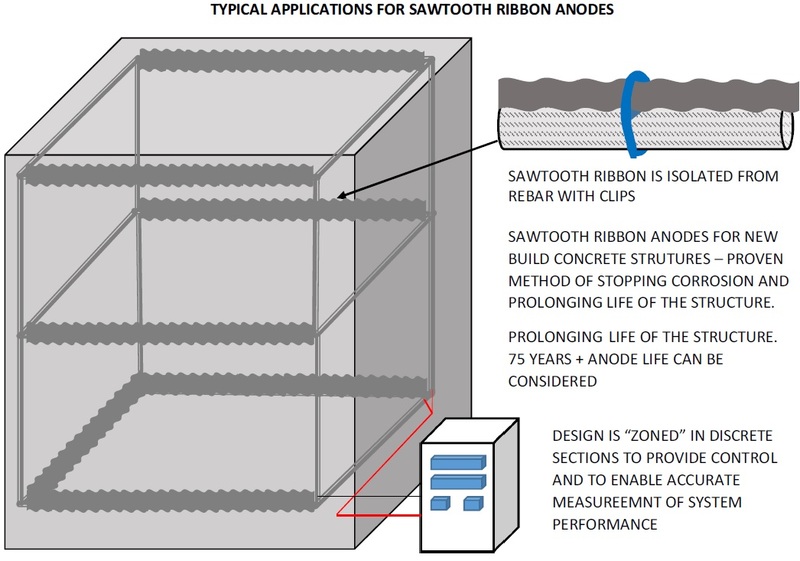 Telpro Sawtooth Ribbon Anode provides greater flexibility because the ribbons are laid on the concrete surface in parallel lines with the separation between ribbons adjusted to give the required per square meter output. The maximum spacing between the anodes will vary according to the concrete cover over the rebar, but is usually up to 14" (350mm). The approach is price competitive compared to using a mesh product, especially where you have areas of increased steel density where you simply put more ribbon together.